San José Mexican Cuisine voted "BEST OF PASCO". Walk-Ins Welcome, Good For Groups, Good For Kids, Take Out and Waiter Service. 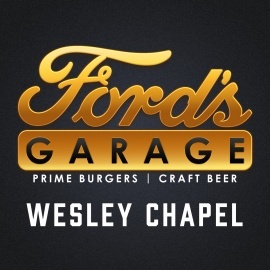 Ford's Garage - Prime Burgers & Craft Beer! Low-key restaurant serving wood-fired pizza, handmade pastas & other Italian specialties, plus wine. Family sports pub. Call 813-909-2300 for take out.